“These declines are remarkable and unprecedented in the survey’s more than decade-long history,” Sara Collins, the lead author, said in a press release. “They indicate that the Affordable Care Act is beginning to help people afford the health care they need." 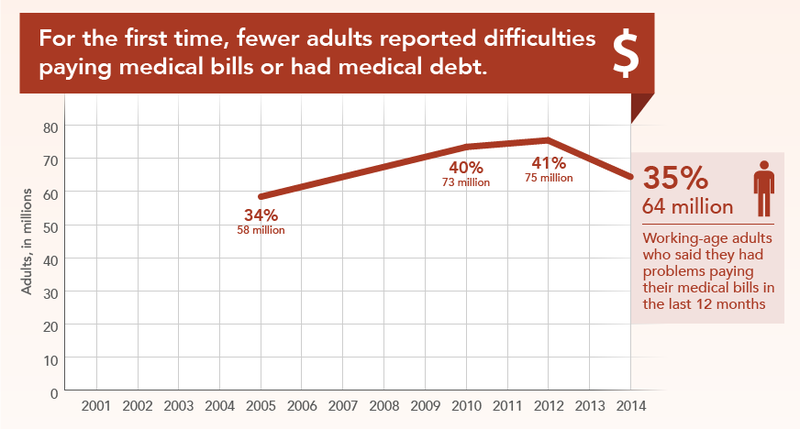 As the chart from Commonwealth shows, the percentage of Americans reporting problems paying off medical bills or medical-related debt rose from 2005 to 2012. Rising health-care costs, stagnant income growth and the aggressiveness with which providers go after people who haven't paid their bills all contributed to this growth, according to Commonwealth Fund president David Blumenthal. The Affordable Care Act has reversed what had been a "deterioration" of the American health-care system, according to Blumenthal. 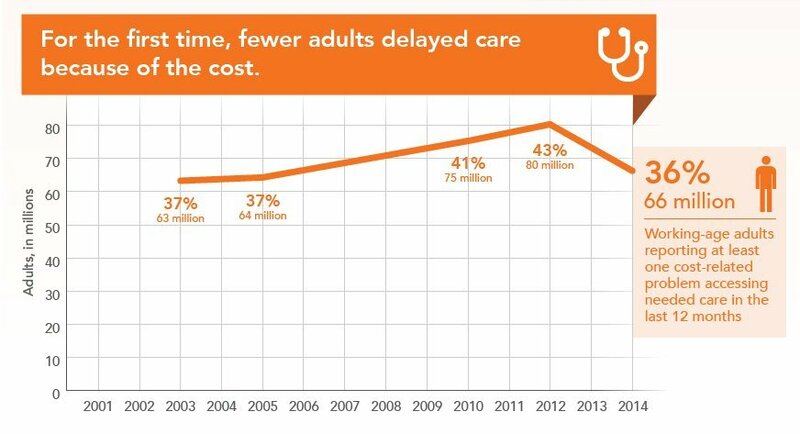 The survey also found that, for the first time since 2003, there has been a decline in the number of people putting off health care because of the cost. In 2012, a record 80 million people said they didn't visit a doctor or clinic for a medical problem, didn't fill a prescription, skipped a follow-up, treatment or test, or did not get needed specialist care, in order to avoid paying for it. That number fell to 66 million in 2014. Medical-bill debt, which is often expensive and unexpected, can significantly harm people's credit ratings, as a recent study from the Consumer Financial Protection Bureau pointed out. Nearly 20 percent of credit reports are hurt by overdue medical bills.